It's impossible to pinpoint a single quality that would make one state "happier" than any other, since happiness is inherently so subjective. However, you can apply some quantitative methods to analyze the overall happiness of a particular population (and not just by measuring the number of puppies, happy hours, and pizza joints per capita). That's what the folks at WalletHub just did, and they presented their findings by ranking all 50 states from least happy to happiest. Spoiler alert: Minnesota may be cold and dark for months on end, but dammit, it's happy. To measure a state's collective happiness, the researchers weighed 28 different metrics in three key areas: emotional and physical well-being, work environment, and community and environment. Specifically, they looked at things like rate of depression among adults, work hours/commute time, ideal weather, suicide rate, and divorce/separation stats. 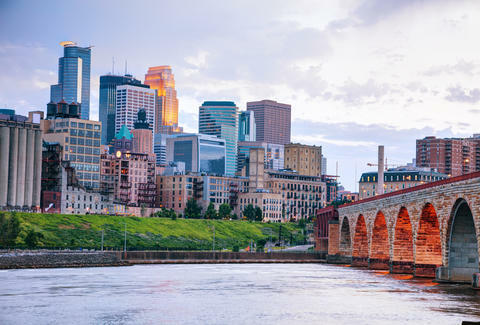 It turns out that for 2017, Minnesota is the happiest state, followed by Utah, Hawaii, California, and Nebraska. Conversely, the least happy states include West Virginia, Oklahoma, Louisiana, Alabama, and Arkansas. Besides the overall ranking, the Wallethub team also revealed some "best" and "worst" states for a handful of the individual metrics. For instance, when it comes to Highest Income Growth, North Dakota is the best and Nevada is the worst. If getting enough sleep is your concern, Colorado has the highest adequate sleep rate, while Hawaii has the lowest. However, Hawaii boasts the lowest share of adult depression (Oregon has the highest). Of course, statistics can't account for your individual taste, and what makes you happy. That said, if you need us, we'll be searching for flights to St. Paul.